The Ion Age Blog: IAF064 Adder Vehicle 15mm Conversion Pack Released! IAF064 Adder Vehicle 15mm Conversion Pack Released! We at the Ion Age are starting to get into vehicles in a big way with some released and more to come but today we release the re-mastered 15mm Vehicle Conversion Pack which is filled with useful pieces in white metal. Pieces for adding to or changing your Adder Combat Cars and Adder Combat Lifters along with most other Human vehicles and even your infantry too. Build terrain or vignettes too. Or just personalise a scenic base or wreaked vehicle. 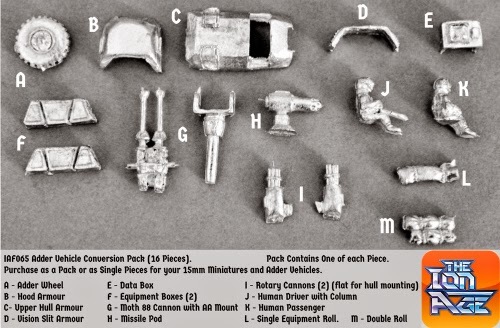 With sixteen different pieces and the option of purchasing them as single bits there is a lot you can do to your 15mm scale science fiction vehicles with this code. This set was originally in the HOF Range at 15mm.co.uk but has been given over to us at the Ion Age along with the vehicles from that venerable range. 15mm Scale white metal parts for our Adder Vehicles. These will fit on all Adder series vehicles which are wheeled, lifter and so on. They can also be used on other vehicles and items such as the equipment rolls will fit on our Muster and Retained Knight miniatures. Great for personalising your forces and for making terrain markers or other scratch building projects. Offered in a set pack of sixteen pieces (one of each piece) or three packs and save 10% or as single items as shown in the image below which you can click on to enlarge. HERE. Price per pack is 4.00GBP with single items ranging from 0.25GBP to 1.00GBP based on size. Use the drop down list on the web page to make your selection. 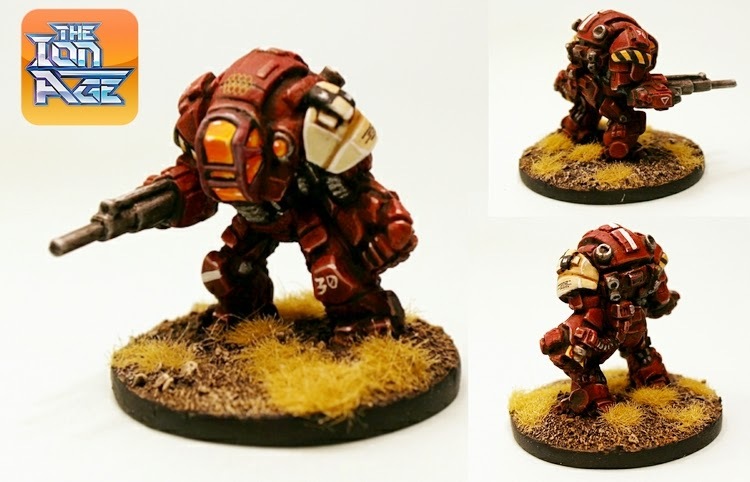 10% Off Havelock Battlesuits and Freebies in Orders – Last Few Days! This week we put up a great blog post showing Sam Croes own take on his Havelock Battlesuit for the Marcher Barony of Castella. Its well worth a read and since its our birthday month we have taken 10% off all of the Havelock Battlesuit types. This means also that if you select the 'buy three get 10% off' option you will actually get 20% off. Excellent eh. This offer lasts until the end of the month as does our month long offer of 10% of your order value in our choice of freebies from the range automatically placed in your order. So save on the Havelock and get something additional free! Our birthday month is almost over now with only a few days to go. What does this mean? Well there are only a few days to get the IMP12 Starvaulter Instructor free in every order before it is retired from free. It means the Havelock offer and the freebies offer will run out at the same time at month's end. Its been a manic month with a lot of releases such as the Year One Collection, the Geo Shelters and The Corbal Deployable Hardpoint. We have actually given away some really impressive free items with a few orders so large that they got Block Houses, Landing Pads and Hab Domes free. So if you want in now is the time before we go back to normal. Free miniature, extra free goodies AND by placing an order with us you sign up for an account and earn points on all purchases which can be used later for discounts, special items and more. See you in September! IAF064 Geo Shelters range Released! IAF041 Corbal Deployable Hardpoint Released! From Birth to Now a Round Up of Our First Year! SEORC Geo Shelters Early Supporter Offers!